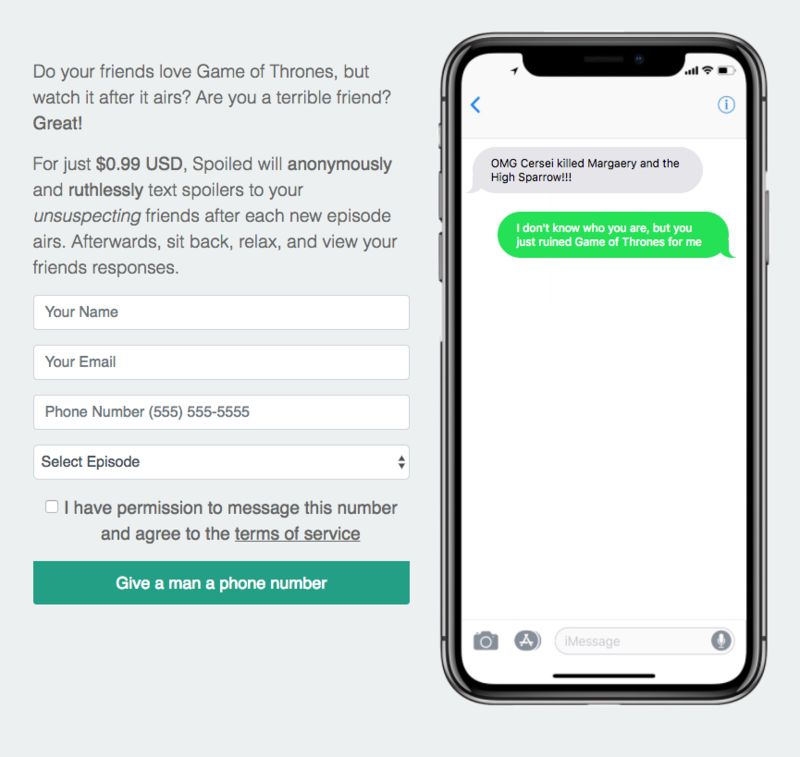 WITH THE final series of Game of Thrones fast approaching a new website has launched offering customers the chance to ruin the show for their friends on a weekly basis. Given the amount of double-dealing and back-stabbing that goes on on the HBO fantasy franchise, it’s hardly a surprise to learn a new service has popped up seemingly taking inspiration from the show. It’s called Spoiled.io and, according to the homepage, it is offering a new service that will “ruin Game of Thrones for your friends automatically”. “Do your friends love Game of Thrones, but watch it after it airs? Are you a terrible friend? Great!,” the website says. Perfect for anyone sick to death of people talking about Game of Thrones or those eager to get the edge on their fellow GoT lovers, the system couldn’t be simpler. All customers need to do is enter the details of their chosen target and then sit back and wait for the carnage to come. As an extra sweetener, the service will send any angry responses from the target to the customer. Though still in its infancy, the service has already proven a hit. “I don't think we'll be quitting our day jobs anytime soon, but the response has far exceeded our exceptions and made us question ways we could expand,” Spoiled, the developers behind the service told Business Insider. Misery is coming for some Game of Thrones fans. Better turn off your phone until you have seen the latest episode. Just in case.